Do you like E.T. ? Do you enjoy aliens who try to abduct young children and look like scrotums? Do you hate yourself with the passion of a thousand dying suns? 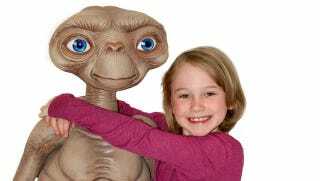 Then you might want to order yourself NECA's new 1:1-scale E.T. replica! This puppet stands nearly three feet tall, can be pre-ordered for $250, and has an extended index finger on its right hand, for all your "bad touch" needs!